1996-97 SP Basketball ups the ante as far as technology and the hobby go. With inserts freely mixing foil, holograms and other premium designs, the release would still stand out as different in today's marketplace. The release is further bolstered by a deep crop of rookies, all of which are very affordable when compared with some other sets. The 1996-97 SP Basketball base set has 146 cards. Veterans occupy the first 126 spots on the checklist. The design has lots going on but maintains a look that isn't overly busy. A pair of stripes run down the right side of the card with the team name running vertically in the second one. A thin foil stripe runs on the inside, vertically up the side and horizontally along the bottom to make a name plate. A cluster of SP logos are in the bottom-left corner as well as a prominent foil one in the top-left. Rookie cards, the final 20 cards in the set, have a totally different design. A posed portrait takes up most of the card. A large blue stripe runs vertically up the left side of the card, acting as a name plate. It also notes the Premier Prospects subset. 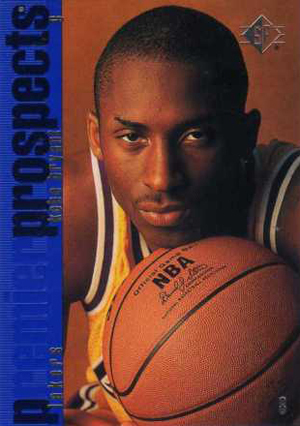 1996-97 SP Basketball has several top rookie cards, including Kobe Bryant, Steve Nash and Allen Iverson. Although this is a super premium brand, these rookie cards be found relatively cheaply, especially when you compare them to what their 1996-97 Topps Chrome and 1996-97 Topps Finest counterparts go for. 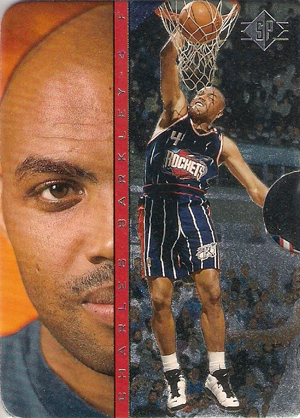 Where 1996-97 SP Basketball really stands out is with its inserts. Holoviews (40 cards, 1:10 packs) are highlighted by the familiar player hologram. However, this year's design also includes etched foil to make the look even stronger. 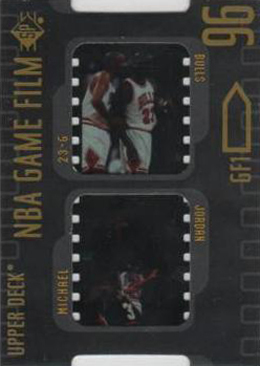 Game Film (ten cards, 1:120 packs) are die-cut cards that use a pair of slides to showcase the player. 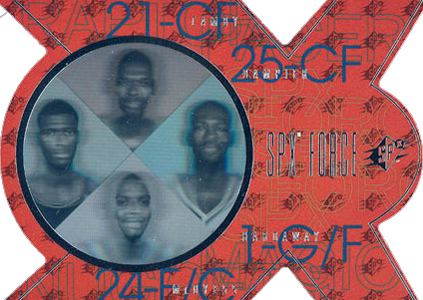 SPx Force (five cards, 1:360 packs) have four player holograms and a distinct die-cut design. 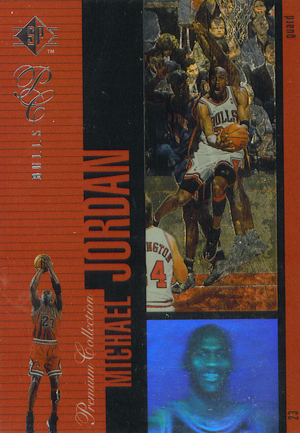 Michael Jordan, Damon Stoudamire, Shawn Kemp and Anfernee Hardaway each signed 100 cards. Every sealed 1996-97 SP Basketball box comes with an Inside Info box topper. These cards have a component that slides out to reveal more images. There is also a rare Inside Info Gold parallel. 1996-97 SP Basketball boxes have 30 packs of eight cards. They originally came wrapped in plastic with the small Upper Deck logos all over it. Collectors should be very suspicious of any that don't have such wrap. KOBE BRYANT 1996-97 BOWMANS BEST ROOKIE RC SP CARD #R23! QUANTITY AVAILABLE PSA? TWENTY-FIVE ( 25 ) 1996-97 SP - MARCUS CAMBY ROOKIE CARDS! 10 cards. Inserted 1:120 packs. 40 cards. Inserted 1:10 packs. 17 cards. Inserted as a box topper. 4 cards. Each signed 100 cards. 1996-97 Upper Deck SP Factory Sealed Basketball Hobby Box Kobe RC? Jordan Auto?